This easy Smoked Salmon Spread Recipe takes only about 1 minute to make in a food processor and is perfect for no-fuss hors d'oeuvres and healthy after-school snacks. Because we live in Boston, we usually use smoked salmon from Maine, Nova Scotia, or parts of Eastern Canada for this recipe. You can use whatever smoked salmon is best in your local area. Fresh dill, horseradish, and an optional hint of goat cheese give this Smoked Salmon Spread Recipe its addictive flavor. 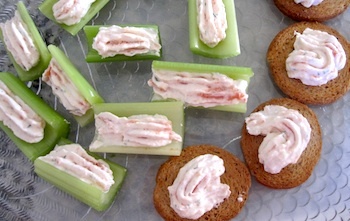 We like to serve this versatile salmon spread on crackers, piped onto endive leaves or bite-sized pieces of celery, or on thinly sliced French bread. 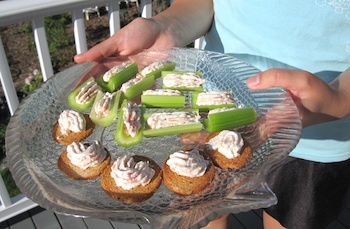 You can also use this smoke salmon spread recipe as the foundation for a tasty sandwich (just add mixed greens and perhaps a few capers) or use a knife to stuff it into celery stalks for a quick and healthy after-school snack. And it can't be beat as a topping for bagels. Put all of the smoked salmon spread ingredients except for the smoked salmon into a food processor bowl. Pulse about 12 - 15 times, until mixture is fairly smooth and blended. Use a spatula to scrape down the sides of the bowl. Add the smoked salmon, and pulse 3 - 5 more times. You should still be able to see bits of salmon, which gives a nice texture to the spread. Refrigerate until you're ready to assemble your appetizers. 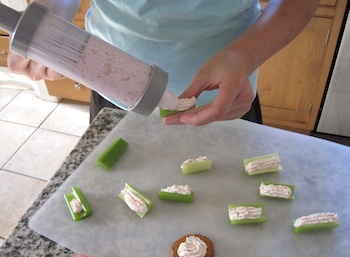 Fill a pastry tube with the smoked salmon spread, and pipe onto endive leaves, celery, cucumbers, or crackers. Or spread with a knife. For the easiest hors d'oeuvres of all, just put the smoked salmon in a bowl and serve as a dip for raw veggies, chips, or crackers. Best of all, you can make this easy smoked salmon spread recipe several days in advance and keep in the refrigerater until you're ready to use it - the perfect no-fuss appetizer!